Want to spend a summer’s night under the stars with a fire roaring and want to save your hard earned money at the same time? 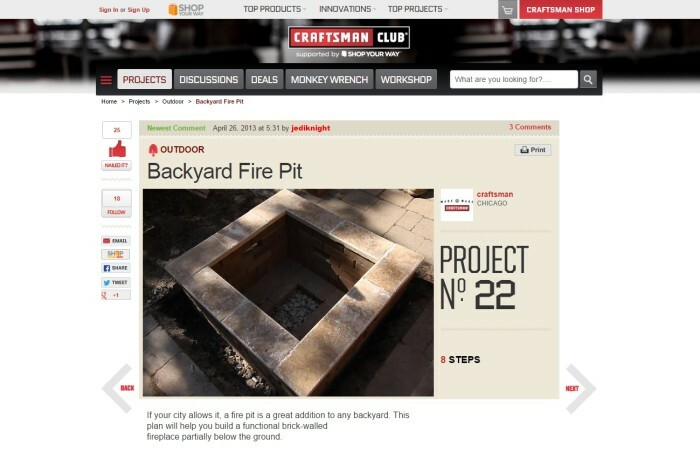 Fire pits allow you to safely start flames in your backyard without fear of catching grass or trees and thanks to this article you can easily build yours in no time! Aesthetically pleasing, these are in high demand, but the boring black models found in stores are often less than appealing! 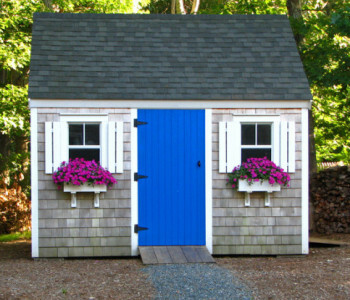 If you feel like spending a weekend building your own, there are a lot of plans that will help you get started. Let’s take a look at 8 DIY instructions and designs that are completely free. They provided a step-by-step guide. 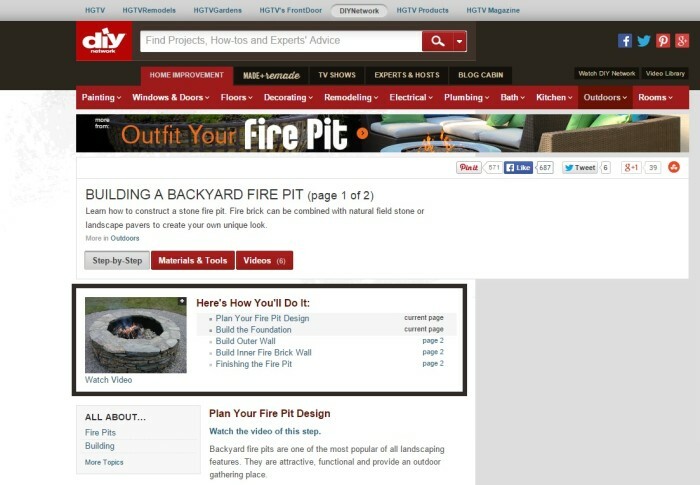 There are videos included to show you how to build your pit. You’ll need some basics, such as capstones, firebrick and paver stones to get started. You’ll also need screen board and ready-mix concrete. This pit will be a two day or more project simply because you need to wait for the concrete and other materials to fully dry. Keep in mind: When complete, you’ll have a rocked area where you can setup chairs and kick back your feet while flames are burning. Do you have a Lowe’s nearby? If so, you’ll be able to create this model very quickly. The hardware store has plans that you’ll be able to use to create a pit. This looks much like the previous desing, but there’s a lot less work involved. However, you’ll need to have a paver base! After this, you’ll need concrete blocks and a steel bowl. This is placed on the paver base and then you’ll set up your blocks in a circle before removing the top. Now, finish building your 4 brick high circle and place your fire bowl in the middle. Keep in mind: Simple, yet functional. You’re now set to start your flames. The great part is that there’s an accompanying video to walk you through all of the steps. Keep in mind: This option requires you to cement your pit to a concrete floor. If you don’t have one, you’ll want to choose a different solution. Dig a circular hole in the ground. Keep in mind: This model also call for cement, but a lot of readers recommend FireClay. This is a very unique look and a design that is simply stunning. Craftsman provides a medium difficulty plan that only requires bricks, sand, gravel, cap pieces, masonry adhesive and fireplace andiron. This plan will provide you with a square put. You’ll first dig a 12-inch hole in the ground where you’ll lay your initial brick-layer down. Then, you’ll add gravel, air flow holes and build your brick walls as high as you see fit. The top of the pit has finished stones. Granite or another type can be used. Pay attention: The only time that this plan may be difficult is if there are tree roots that need to be removed. So easy, mom can do it! If you’re on a budget, this is the best option for you. 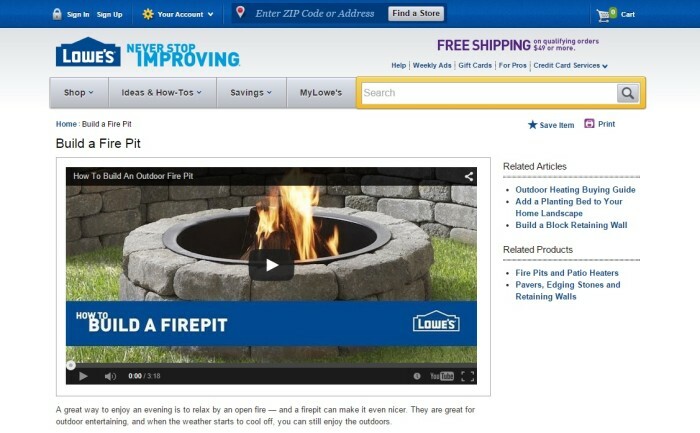 Much like our other solutions, this one will use a standard fire pit. The idea is simple: purchase a circular pit and build stones around it. Pay attention: This simple, yet effective construction is stunning and beautiful. Besides the metal bowl, you’ll need landscaping bricks and wood for burning. 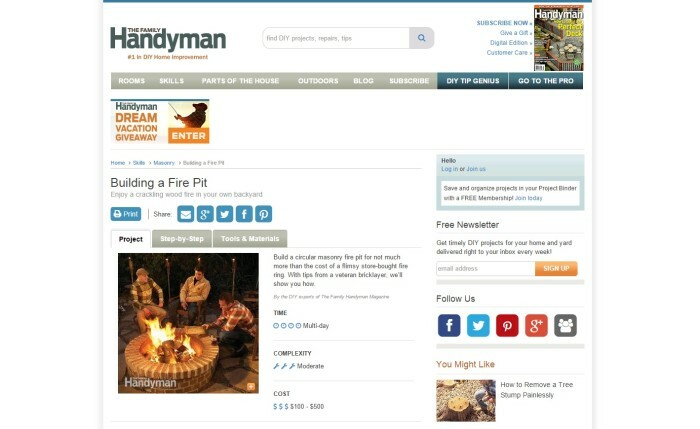 The Family Handyman is a great resource simply because they break down everything for you: complexity, cost, tools, material, and of course, a step-by-step guide. Labeled as moderate complexity, required materials will cost you $100 – $500 in total. You’ll be using cardboard form, concrete, rebar, fire & face bricks, refractory cement and mortar mix. Photos and tips are included to make building even easier. Ultimately, this project features a circular pit and is considered multi-day to complete. The final option on our list is also the most creative. A washing machine that’s no longer in use will be needed for the job. While it will only cost you $10 to build this, you’ll need a spare machine on hand or you’ll have to find one at the junk yard to purchase. What you’ll need is its drum and some steel legs or a base to put it on. The creator also paints and sands it, but this is all optional. Technically, you can place the drum itself on a concrete slab and you’re good to go. Keep in mind: If you want a look that’s more modern and provides a little flare to your backyard, this is a great model. Sometimes, you just want a few ideas and inspirations to work off of to build your very own design. Truly, once you have the basic safety precautions in place, you can let your imagination run wild. The following two resources are great for ideas and inspiration. 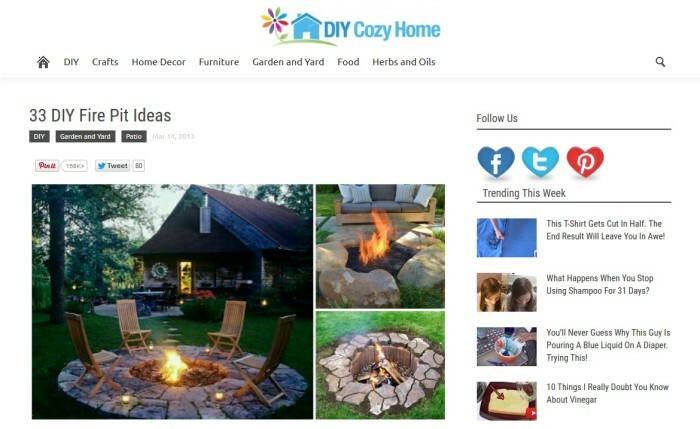 DIY Cozy Home provides ideas for 33 different fire pits. From circular to in-the-ground or square, you’ll find them all among this collection. There are even glass and tabletop models included within the collection. The best part is that there’s links to learn more about each pit and see plans as well. Want inspiration? 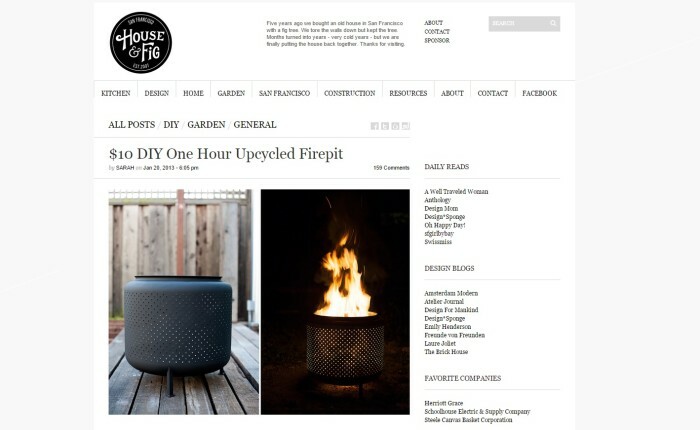 Houzz has over 59,000 photos of fire pits from across the globe. There are so many options available that you’ll lose count along the way. There are also links to models that have been pre-built and can be purchased right on the site. Many of these designs have been created by professional masons, so you’ll see the best-of-the-best within the collection. 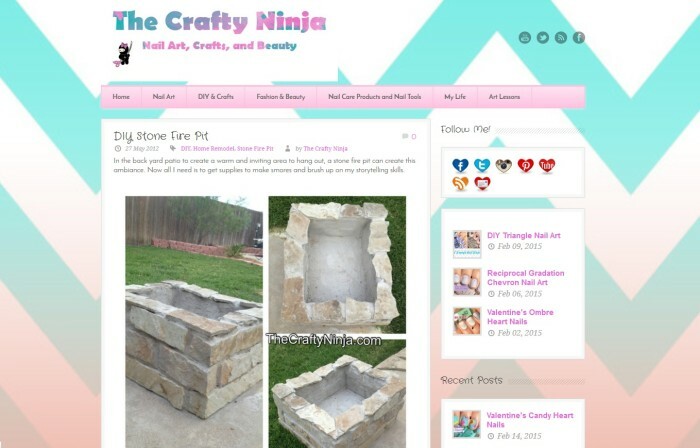 You’ll also be able to find professionals to build a special pit on the site as well. 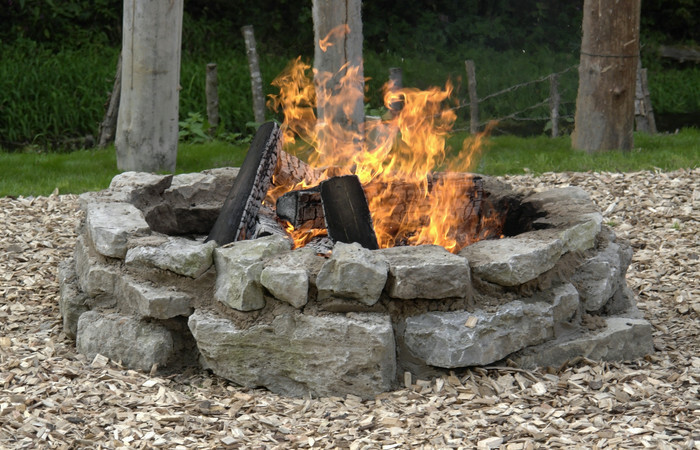 When it comes to fire pits, it’s up to you to choose the right one for your yard. It’s a weekend project to create yours, and it will take a little help from one of the eight plans above. Once you master the basics, you’ll be able to create and construct one to your own liking with ease. Through the ideas and inspirations we provided, you’ll surely find something that catches your eye. The only word of caution is that you’ll want to consult with your local fire department on the rules and regulations pertaining to specific pits and fire codes. Please note: Do not forget to check out this great article as well – Top 8 Sources of Popular Woodworking Projects & Plans!